ArcGIS Data Store is part of the overall ArcGIS Enterprise platform. 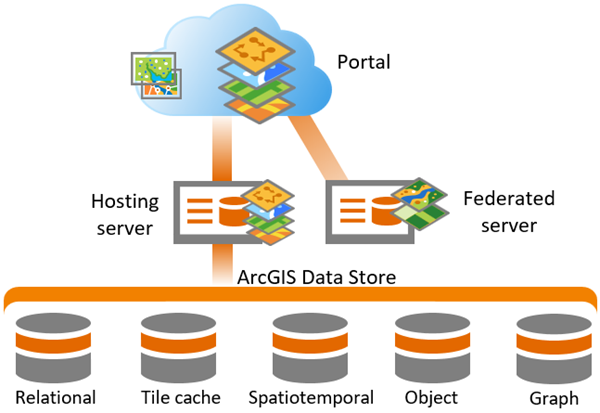 There are three ArcGIS Data Store types you can use: relational, tile cache, and spatiotemporal big data stores. All three store data for services that run on the ArcGIS GIS Server site that you configure as your Enterprise portal's hosting server. For best performance, each of these data stores should run on a different machine; otherwise, they will contend for memory resources. The GIS Server site you use as the portal's hosting server must be installed and configured before you create any data stores. Follow the instructions in the ArcGIS Server installation guide to install and configure a GIS Server site. Esri recommends that your data stores run on different machines than your ArcGIS Server sites so they don't compete for memory and other resources. This is especially important for spatiotemporal big data stores; you should always install those on their own machines separate from other software such as ArcGIS Server and other data stores. An exception to this is if you are configuring workgroup ArcGIS Enterprise deployment, which would not be used by as many clients. See the ArcGIS Enterprise functionality matrix for an overview and your Esri license agreement for full details on configuration restrictions. ArcGIS Data Store and Portal for ArcGIS communicate with the GIS Server site over HTTPS. By default, ArcGIS Server communicates via HTTP and HTTPS; therefore, your ArcGIS Server sites can communicate with ArcGIS Data Store and Portal for ArcGIS. If you configure your portal and data store to communicate over HTTPS only, though, change your GIS Server site's communication protocol to HTTPS only too. Once the GIS Server site you will use for your hosting server exists, you can create the data stores you need. Before you start using the system, you need to install and configure Portal for ArcGIS, and register federated servers and a hosting server. If you have not already done so, set up your portal. See Getting started with Portal for ArcGIS for instructions. As mentioned in the previous section, it is best to install Portal for ArcGIS on a machine separate from your data stores, especially in the case of spatiotemporal big data stores. Once your portal exists, the portal administrator can federate servers and designate a hosting server. See Federate an ArcGIS Server site with your portal and Configure a hosting server for instructions. For portal members to use the functionality that writes to each type of ArcGIS Data Store, the portal administrator must assign members to roles that have the required privileges. For information on portal privileges and assigning roles, see User types, roles, and privileges and Configure roles.